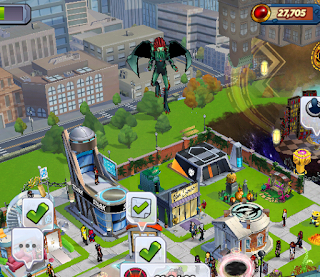 Black Widow: Have you found a way to keep me hidden in the Dark Dimension and beyond? It might be our only chance of getting the intel we need to stop whatever Kaecilius is summoning. Black Widow: I'll decide what's too dangerous. Doctor Strange: There's an artifact called the Heart of Cthulhu. It's said that the wearer becomes bonded to the ageless entity, gaining its abilities, and altering one's appearance. 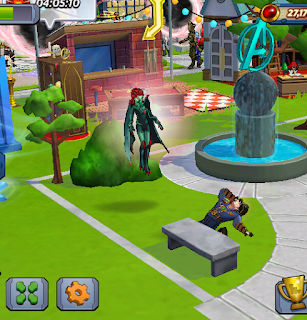 Black Widow: And the creatures in those dimensions won't notice me? Doctor Strange: If anything, most will either fear or worship you. But I can't let you do this. Cthulhu is known for inducing immediate insanity. You can't maintain a sound mind under its influence. Black Widow: Never tell me what I can't do. Doctor Strange: How do you feel? Cthulhu Black Widow: Different. Weird. Powerful. Doctor Strange: Are your thoughts stable? Are you hearing voices? Are you inexplicably drawn to water? Stars? Chaos and destruction? Cthulhu Black Widow: No more than usual. Doctor Strange: This is serious, Black Widow. You need to tell me immediately if you feel your mind beginning to slip. Cthulhu Black Widow: Relax, Doctor. The creatures of the Dark Dimension are the ones who need to be worried. Doctor Strange: We need to make sure you're in control of Cthulhu's powers before entering the Dark Dimension. 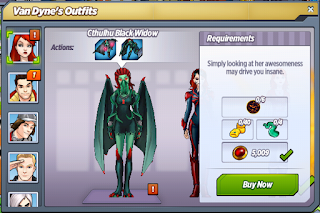 Cthulhu Black Widow: How do we do that? Cthulhu Black Widow: Are you alright? Doctor Strange: Yes. I'm fine. I'm fairly certain these unimaginable nightmares won't be permanently burned into my retinas. Cthulhu Black Widow: Do you really think you went temporarily insane? Cthulhu Black Widow: We can't wait any longer. I need to enter the Dark Dimension, and see if I can find out how to stop whatever Kaecilius is summoning. Doctor Strange: You may have to travel even further. It sounds as if whoever Kaecilius is dealing with controls the Dark Dimension, but the older beings in the farther shadow realms might be more willing to share information. 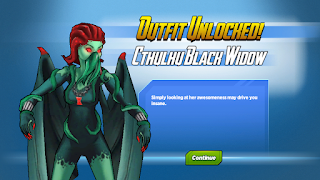 Cthulhu Black Widow: How do I get there? Doctor Strange: Use one of Professor Pym's portals in S.H.I.E.L.D. Headquarters. It's better protected, and I should be able to cast a spell to guide your way. Cthulhu Black Widow: What will you do? Doctor Strange: Worry. Pace. Use every spell in my arsenal to distract mystical beings here and in other planes in hopes of ensuring your safety. Cthulhu Black Widow: I told you not to worry about me. If any of these creatures notice me, I'll make sure they lose the trail. Cthulhu Black Widow: Get out of my way. Cthulhu Black Widow: I did what I had to. Saw things I wish I hadn't. Found out more than I ever wanted to know. Doctor Strange: I should examine you to ensure the Heart of Cthulhu isn't corrupting your soul or twisting your mind. 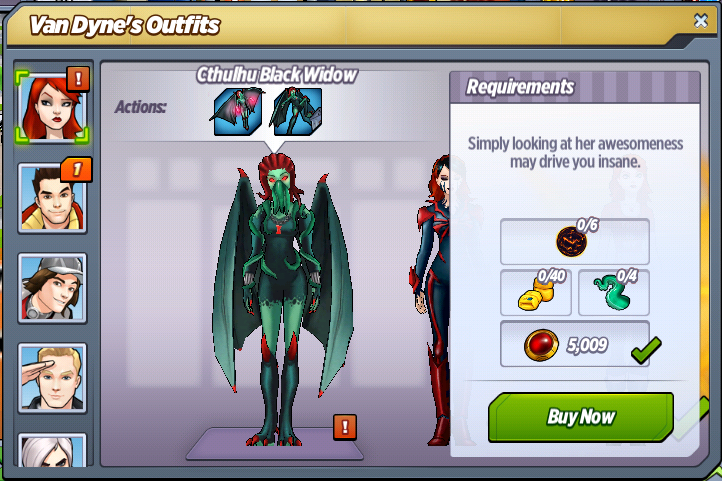 Cthulhu Black Widow: You can't help me anymore. Cthulhu Black Widow: You tricked Kaecilius into going down this path. You let yourself get imprisoned on purpose. Why? Mephisto: We caged Super Villains were not created equal. 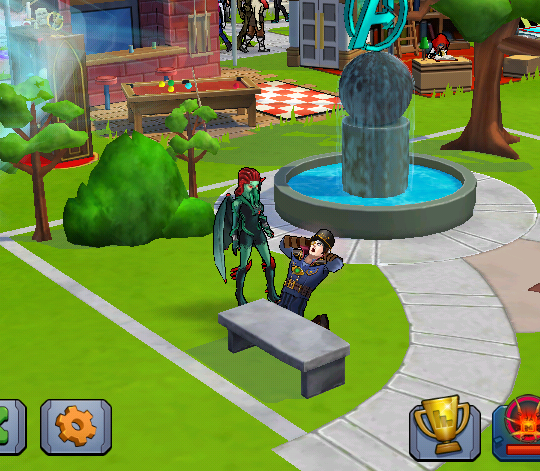 Ronan, Red Skull, and Carnage seek nothing but destruction. Kingpin and I have bigger plans. He's surprisingly patient for a mortal. Cthulhu Black Widow: Answer the question. Mephisto: Make me a deal. Doctor Strange: That was incredible in the best and worst possible ways. We need to immediately remove the Heart of Cthulhu! Cthulhu Black Widow: I'm not finished. Cthulhu Black Widow: Is inside your mind. Doctor Strange: You can't be. The Heart of Cthulhu is my artifact. I'm the Sorcerer Supreme! 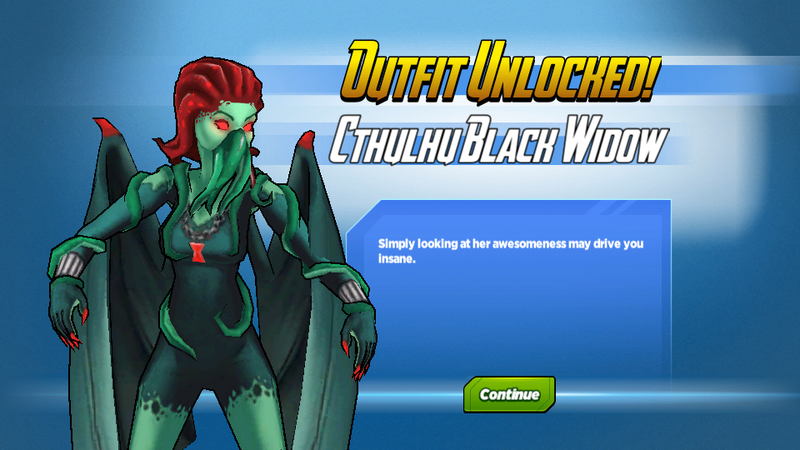 What do you think of Cthulhu Black Widow? Don't you just love her new actions? Cthulhu fhtagn!